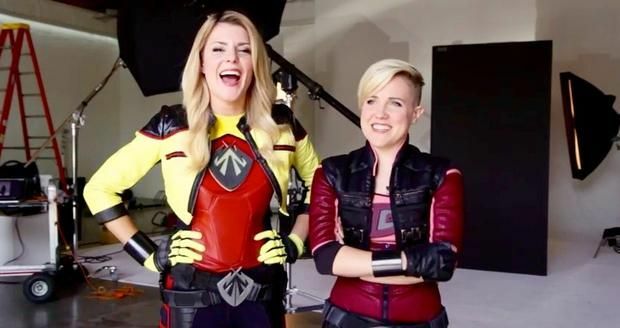 [Source: Yahoo!Tech] The first trailer for the "Electra Woman and Dyna Girl" webseries starring YouTube celebs Grace Helbig and Hannah Hart debuted Saturday at VidCon. The original 1976 "Electra Woman and Dyna Girl" series from Sid and Marty Krofft starred Deidre Hall and Judy Strangis. The show aired 16 episodes as part of the kids series "The Krofft Supershow." In 2001, the WB Network commissioned a pilot for a reboot of "Electra Woman and Dyna Girl." However, unlike the original show this pilot was written as a cynical parody -- and never aired. This newest rendition of "Electra Woman and Dyna Girl" from Legendary Digital Media and Fullscreen follows two superheroes (with Helbig as Electra Woman and Hart as Dyna Girl) as they relocate from Akron, Ohio to Los Angeles in hopes of fighting crime. Of course, it's not as easy as they think when they discover other vigilantes who aren't exactly thrilled with their arrival in the City of Angels. In the new trailer, we see the dynamic duo punching bad guys, wearing colorful costumes, getting a Hollywood agent, perfecting their victory dance and driving a car that would even impress Batman. This isn't the first time Helbig and Hart have teamed up. The two also starred in the YouTube celeb fest feature film "Camp Takota" and have appeared on each other's shows: Hart's "My Drunk Kitchen" and Helbig's "The Grace Helbig Show." "Electra Woman and Dyna Girl" is due to debut later this year.